June 20, 2011 0 comments on "How to Grow Rhubarb"
I have always grown rhubarb in my garden. Sometimes we eat it and sometimes we don’t, but I think I just enjoy admiring its big green leaves and pretty red stalks. Rhubarb will grow almost anywhere. We have moved our rhubarb plant five times in the past twenty years (yes, twenty!). It just keeps coming back year after year. This plant is very resistant to winter weather and drought. It grows better in northern states than southern states because it doesn’t care for hot humid summer weather. Rhubarb season runs from April to September. You can buy starter plants (root clumps) at most garden nurseries. The best time to plant them is early spring, but I have also transplanted them in fall, and they came back in the spring. 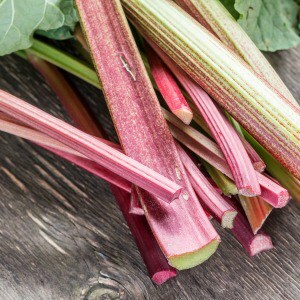 Rhubarb prefers fertile, well drained soil. It thrives best in full sun but will also tolerate part shade (it just won’t grow as large). Plant your rhubarb roots in a hole two feet deep and two feet wide and leave at least three feet between plants. When you place the plant in the hole, the crown bud should be two inches below the ground surface. Add some composted manure or peat moss to the hole before filling it in. 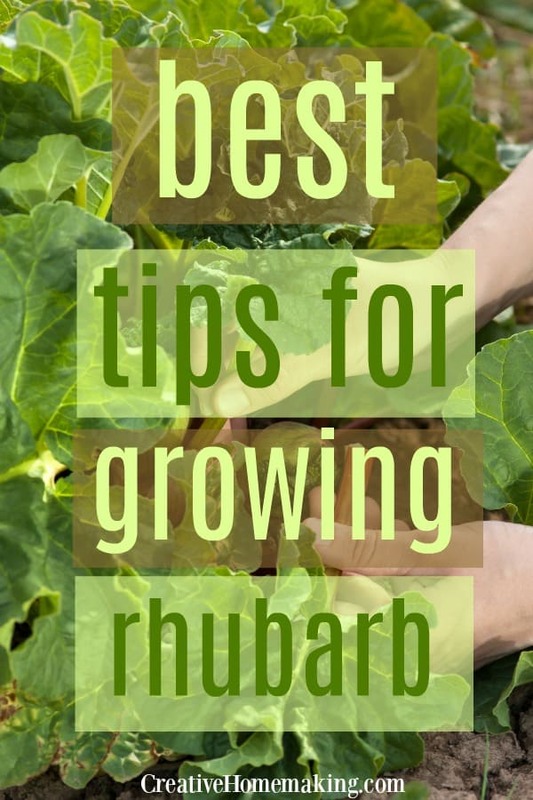 The plant won’t be big enough to harvest the first year, but starting in the second year you can cut a few stalks as soon as they grow to about the size of your finger. Cut the stalk to the ground level. Only the stalks are edible–the leaves are poisonous and should not be consumed. Flowering stalks can be cut and discarded whenever they appear. Fertilize your rhubarb plant with composted manure or leaves in the fall or early winter. Rhubarb is easy to freeze. Choosing firm red stalks, wash in cold water and cut into 1-inch lengths. Place in freezer bags or freezer containers. Leave 1/2 inch space for expansion in freezer containers. Preheat oven to 350 degrees. Mix rhubarb, 3 T. flour, and white sugar and place in bottom of greased 9×13 pan. Mix remaining flour, oatmeal, brown sugar, butter, and shortening until crumbly. Sprinkle on top of rhubarb mixture. Bake 20 min. or until rhubarb is tender. Preheat oven to 350 degrees. Place ingredients in a greased 13x9x2-inch baking dish in the following order: rhubarb, sugar, dry jello, marshmallows. Top with dry cake mix and a little butter. Bake for 45 minutes. Heat rhubarb slowly in covered pan until rhubarb is tender, adding a little water if necessary. Add sugar and cook until sugar is dissolved. Stir to keep from sticking. Add gelatin and stir until dissolved. Pour into jelly jars and refrigerate.